Because Geoff Small is black he can say things in this book that would have been called racist if they had been said by a white journalist. For example, he tries to explain differing levels of violence in the island nations making up the West Indies by the differing natures of the African tribes who were enslaved and transported there. Some tribes were peaceful, some warlike, and Jamaica, birthplace of the Yardies, was populated by representatives of the warlike ones. Combine that with dire poverty and illegal drugs, add the intense rivalries of local politics and asinine interference by the CIA, and you have a recipe for some very violent and dangerous gangs: the Yardies, named after the Jamaican word “yard”, meaning a neighbourhood or district. They started to come to the attention of the media and the general public in the 1980s, as they broke their way into the drugs market in the United States and United Kingdom, and the word used of them then is still being used of them now: “ruthless”. If you have a quarrel with the Mafia, the Mafia will kill you. If you have a quarrel with the Colombians, the Colombians will kill you and your wife. If you have a quarrel with the Yardies, the Yardies will kill you, your wife and your children. In terms of utter ruthlessness, the killing of Cassandra Higgins ranks high on the list. A Jamaican visa overstayer, she was certainly no angel. Still, her demise was shocking by any standards. The nineteen-year-old was stripped naked by five Rude Boys in an eighteenth-floor crack-house on the Cathall Road Estate in Leytonstone, east London. Then, to the horror of those who looked on, she was thrown out of the window 160 feet to the ground. Higgins’s death, in September 1993, was thought to have been the result of a rudie drug deal double-cross on her part. The brutal murder was witnessed by several people, but true to form the mouths of those assembled were welded shut by the force of the posse code: ‘See and blind, hear and deaf’; in fact, not one person was willing to go to court to testify against the killers. 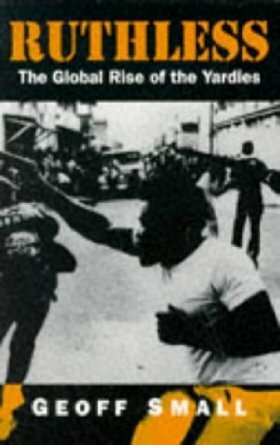 Gangs and gang-warfare have long been fashionable on screen and in print, and this book offers many satisfying fixes for the aficionado of other people’s thuggery as it describes how the Yardies or Rude Boys – “rude” meaning “lawless” or “aggressive” in Jamaican English – invaded expatriate Jamaican communities in the US and UK. Their intent was to take over the drugs-markets there and they succeeded through a combination of extreme violence and use of a Jamaican patois that local police forces often found impossible to understand during phone-taps or surveillances. An often fascinating, sometimes frightening book, Ruthless seems to me more proof of the harm done both by mass immigration and by the illegality of drugs like marijuana and cocaine. Yardies do not kill and terrorize people just for the fun of it: they do it because there are huge sums of money to be made from the illegal sale of drugs and huge amounts of excitement and satisfaction to be had from confronting and outwitting the authorities. Small describes Jamaicans as naturally rebellious, ambitious and aggressive, making a mark on the world in international fields like music and sport out of all proportion to their numbers. The Yardies are another example of Jamaicans making their mark in an international field: that of crime. If we legalized drugs, that field would get much smaller. And if Jamaicans had not been allowed to immigrate in such large numbers into Britain and North America, their criminality would not have inflicted so much misery and imposed so much expense.